Someone has well penned this statement, "A Christian's practical theology is often his hymnology." Many of us could attest to this truth as we recall some deeply moving experience-perhaps the loss of a dear loved one-and a simple hymn which has been used by the Holy Spirit to minister to our spiritual need. Such a hymn is "What a Friend We Have in Jesus." Though it is not considered to be an example of great literary writing, it’s simply stated truths have brought solace and comfort to countless numbers of God's people since it was first written in 1857. 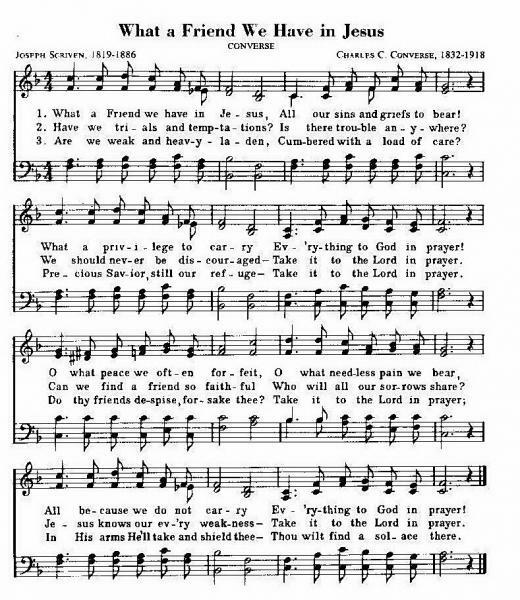 So relevant to the basic spiritual needs of people are these words that many missionaries state that it is one of the first hymns taught to new converts. The very simplicity of the text and music has been its appeal and strength. Joseph Scriven was born in 1819 of prosperous parents in Dublin, Ireland. He was a graduate of Trinity College, Dublin. At the age of twenty-five he decided to leave his native country and migrate to Canada. His reasons for leaving his family and country seem to be two-fold: the religious influence of the Plymouth Brethren upon his life estranging him from his family and the accidental drowning of his fiance the night before their scheduled wedding. “What a Friend We Have in Jesus" was never intended by Scriven for publication. Upon learning of his mother's serious illness and unable to be with her in far-off Dublin, he wrote a letter of comfort enclosing the words of this text. Some time later when he himself was ill, a friend who came to call on him chanced to see the poem scribbled on scratch paper near the bed. The friend read it with keen interest and asked Scriven if he had written the words. Scriven, with typical modesty, replied, "The Lord and I did it between us." In 1869 a small collection of his poems was published. It was simply entitled Hymns and Other Verses. “Four miles north, in Pengally's Cemetery, ties the philanthropist and author of this great masterpiece, written at Port Hope, 1857." The composer of the music. Charles C. Converse, was a well-educated versatile and successful Christian, whose talents ranged from law to professional music. Under the pen name of Karl Reden, he wrote numerous scholarly articles on many subjects. Though he was an excellent musician and composer with many of his works performed by the leading American orchestras and choirs of his day, his life is best remembered for this simple music so well suited to Scriven's text.